2017: 12 Months of Breakthrough Progress on Climate Change - Planet Aid, Inc.
With climate change it is often easy to focus on the bad news. But as the year draws to a close we reflect on what has happened in 2017, and there are a number of reasons to be optimistic about what can be achieved. There are a huge number of inspirational and committed people around the world, working hard to create positive change. Their collective efforts are starting to deliver genuine transformation, accelerating the transition to a sustainable, low carbon economy. To end 2017 on a positive note, we have picked out 12 real breakthroughs from the past 12 months that are helping to turn international ambitions on climate change into a reality. January: China cracks down on coal with the National Energy Administration announcing that 104 coal plants with a total capacity of 120 gigawatts – both in planning and under construction – are to be suspended, helping the country to deliver on its current Five Year Plan and climate change ambitions. February: Wind power continues to grow, as it is announced in the US that it has overtaken hydroelectricity to become the biggest source of renewable energy in the US, and in the EU wind power surpasses coal to become the second largest source of installed electricity capacity, behind gas. 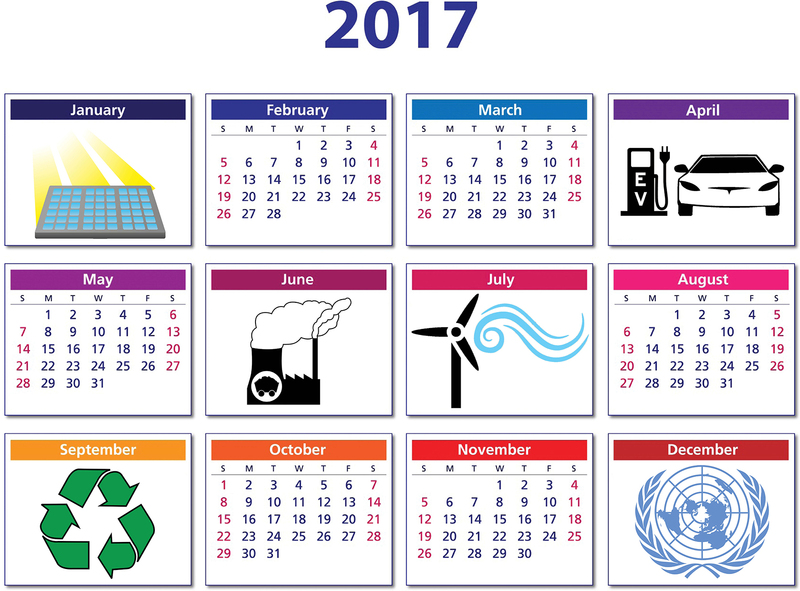 March: The International Energy Agency confirms that in 2016 - for the third year in a row - global emissions from the energy sector remained flat despite economic growth. This trend is likely to be bucked for 2017, where some growth is expected, but this creates optimism that we may be close to peaking global emissions. April: In a landmark moment that was the fruit of years of investment into innovation and cost reduction in offshore wind, Ørsted wins the rights in a competitive auction from the German government to build the world’s first subsidy-free offshore wind farm. May: Tesco becomes the first business in the world to announce that it has set science-based targets to reduce its own carbon emissions in line with the 1.5°C ambition in the Paris Agreement, a goal that has since been signed up to by others including Carlsberg Group and BT. June: With strong support from central banks, governments and the world’s largest investors, the G20 Financial Stability Board’s Task Force on Climate-Related Financial Disclosures launched its final recommendations, providing a common global framework for disclosures of the climate change opportunities and risks faced by companies. July: Elon Musk bets South Australia’s state government that Tesla and Neoen can build the world’s largest lithium-ion battery within just 100 days, in order to provide energy storage at a wind farm and help to solve issues with intermittency and blackouts, or it will provide it for free. He won the bet. August: The future of low cost electric mobility is given a boost, with General Motor’s Chinese joint venture, SAIC-GM-Wulin, revealing its new Baojun E100 model, a two-seater electric car with a 100 mile range. It is available at the low cost of just $5,300, after taking into account national and local electric vehicle incentives in China. September: The price of solar energy falls to yet another a new record low, with Jinko Solar and Marubeni putting in a winning bid to build a 350 megawatt solar park in Abu Dhabi at a cost of just 2.42 cents per kilowatt hour. October: The mayors of 12 major cities with a combined population of 80 million – London, Paris, Los Angeles, Copenhagen, Barcelona, Quito, Vancouver, Mexico City, Milan, Seattle, Auckland and Cape Town – commited to take action on emissions and air pollution by buying only zero-emissions buses from 2025, promoting walking, cycling and public transport, and making major areas of their cities zero emission zones by 2030. November: At COP23 in Bonn the former New York Mayor Michael Bloomberg and California Governor Jerry Brown revealed the first phase of America’s Pledge, a bottom up approach to meet US goals under the Paris Agreement with direct support from cities, states and businesses representing more than half the country’s economy and population. December: China’s National Development and Reform Commission announces the launch of a nationwide carbon market for its power sector on 19 December, instantly creating the world’s largest carbon market ahead of the EU, putting an estimated 39% of the country’s total emissions within an emissions trading scheme. This article was originally published by Carbon Trust.